What are the potential implications of lodging? Economic loss is greatest when crops lodge early. 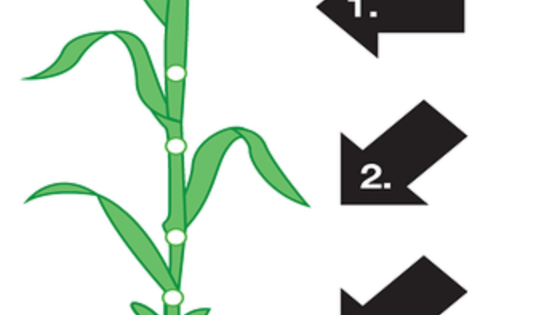 Up to 75% of yield can be lost if crops lodge at ear emergence. Later lodging has less effect on yield, but will impair quality characters such as Hagberg falling number. 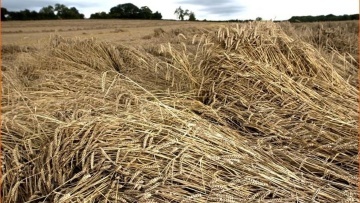 Lodged crops often require extra drying which can cost £3–£7.50/tonne.The scale below shows how loses of £614 per hectare are easily achieved through a combination of factors. 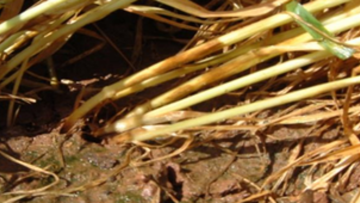 Varieties have different resistance to lodging scores as each variety demonstrates differences in terms of growth habit (height, tillering capacity, stem strength and speed of establishment). Varieties with a score of 7 or less on the Recommended Lists should be considered at risk of lodging. Be sure to check the Recommended Lists on the HGCA website. Yield potential has a role to play in lodging risk because a higher yielding crop will produce heavier ears. Heavy ears put weight on the stem so the higher the yield potential, the greater the risk. It has been estimatedthat each tonne per hectare above 9 t/ha reduces the resistance to lodging score by 0.5 points. 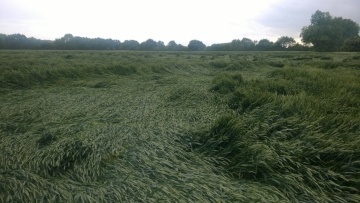 Size of the canopy in the spring is a critical indicator regarding crop development and lodging risk.Size of the crop canopy is difficult to estimate but can be measured by its Green Area Index (GAI), the amount of green tissue per m2 of ground.